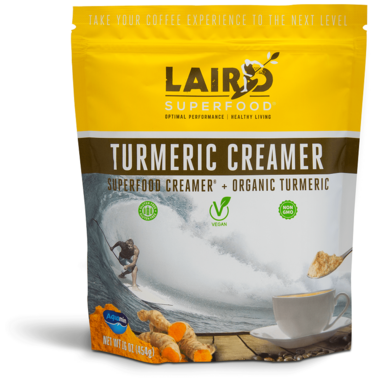 The Laird Superfood Creamer Infused with Organic Turmeric is a dairy-free, vegan and gluten-free coffee and beverage enhancer. The oils in all Laird Superfood Creamers may increase the body's ability to absorb curcumin- the active ingredient in turmeric. Directions: Add 2 teaspoons or mix to taste. Great in hot coffee, smoothies, or tea. Due to no additives this product may clump. Simply massage bag to break up contents before use. Ingredients: Coconut Milk Powder, Organic Coconut Sugar, Organic Turmeric Powder, Aquamin (Calcium from Marine Algae), Organic Extra Virgin Coconut Oil, Organic Red* Palm Oil, Contains 1.2g of organic turmeric per 8g serving.